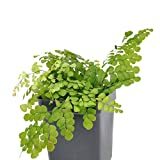 Adiantum venustum for sale – Easy plant to grow, grown for the ornamental for the leaves, planting in spring to autumn and better to buy rhizome or plant. Growing information: perennial plant, growing hardiness zone: 5-10 and also grown as house plant, water needed – average to big amount, light conditions – full sun to full shade, height: 30-70 cm, 12-28 inches. Adiantum venustum for sale – What need to know before buying Adiantum venustum? When is the best season to buy Adiantum venustum? Adiantum venustum for sale – can be buy all year round especially if you planning to grow indoor, better for outdoor in the spring but in hotter climate might be recommended in the autumn, growing requirement: cool winter, rich soil, drainage, moist soil, humidity, when the plant exposure to more sun need more water, when growing Himalayan maidenhair in container or flower pot need to switch every few year the sand and the flower pot to bigger, prune the old and dead leaves.